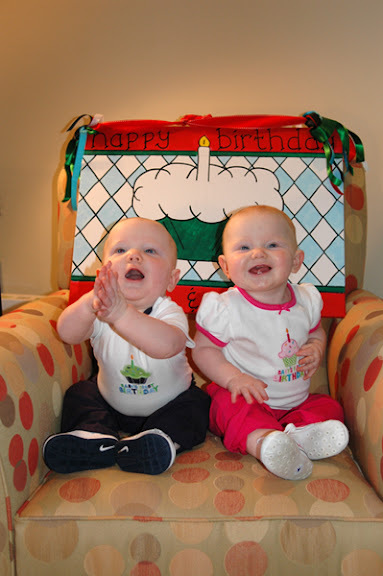 Hulse & Livi : Happy, Happy, Birthday Babies! One year ago today you came into the world. I honestly cannot believe that you are one! Your dad I and went to the doctor for a normal check up that afternoon and 8 or 9 hours later you made your grand entrance. Of course, you came when you were ready and not as we had planned, and you picked the middle of an ice storm to do it. From that moment on, life as we knew it has never been the same. This year has been much different than I imagined your first year would be. It has been easier in some ways, harder in others, frustrating at times, and a complete joy at others. There are many days where I think to myself that I have no idea what I'm doing and other times where I seem to have it all under control. Above all we love being your parents. I am amazed everyday at how you change and grow and absolutely enchant us with your personalities. You are gifts from God, and we are thankful each day for the privilege we have in being your mommy and daddy. We look forward to the next year of your life and all of the things it will bring. Thanks for being the best kids ever! At one year old you are a funny and smart little guy. You love to play and push all your toys around the room. You like to explore in cabinets and drawers, and it only takes a minute for your to empty them out. You're not quite walking yet, but you are very close. You love to eat and are eating real food and drinking whole milk with no problem. You especially love to eat fruit of all kinds and gobble it up. You have the funniest belly laugh when you get tickled. You are quite the talker and can say all kinds of words (ball, book, mama, dada, papaw, uh oh, bye bye). You are a sweet little guy and are pretty laid back for the most part. Your favorite "toys" right now are the ball(oons) that we had at your party. You've got three teeth on the bottom and one poked through the top a couple weeks back. You are a total mess. You also love to play and get into all kinds of stuff, and you get really excited with yourself and love to clap. You have just started walking and are getting more surefooted each day, already making lots of progress since you started last Monday. Your favorite toy is anything that you can convert into a push toy and motor around. You're also a good eater and on big kid food and milk as well. You love to talk as well but seem to speak in your own Livi language - although you do say mama, dada, and bye bye. You don't have any problem with people you don't know and seem to be very outgoing. You're always on the go and have something to do. You got your first two teeth in August but didn't add another until several weeks back when 4 came in all at once on the top. 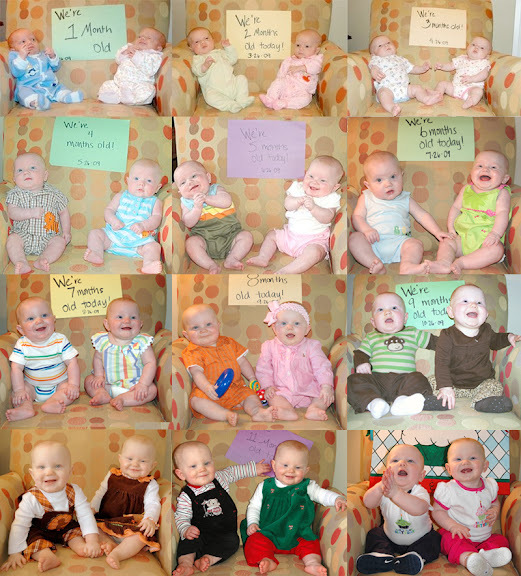 Happy Birthday sweet babies! You are both adorable!